We are collecting donations in preparation of Yellow Ribbon Day. All donated items will benefit Blue Star Mothers-NY2 in their efforts to create “Freedom Boxes” for local troops deployed worldwide. 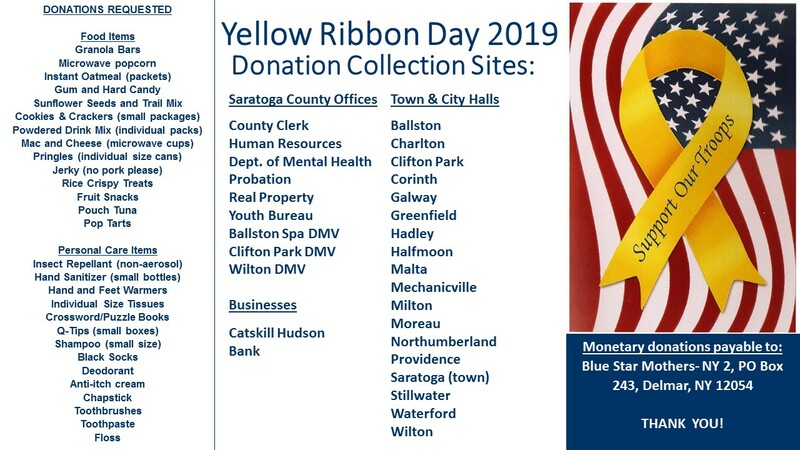 We will present the collected items to Blue Star Mothers at the Yellow Ribbon Day Ceremony on April 9, 2019 in Halfmoon. Please join us in supporting our troops with a donation. Below is a list of collection sites and a list of requested donations. Please Note: Monetary donations are gladly accepted to offset the $10.65 postage cost for each box. Checks can be made payable to Blue Star Mothers of America-NY2 and sent to PO Box 243, Delmar, NY 12054. Please write “In honor of Yellow Ribbon Day” in the memo section. 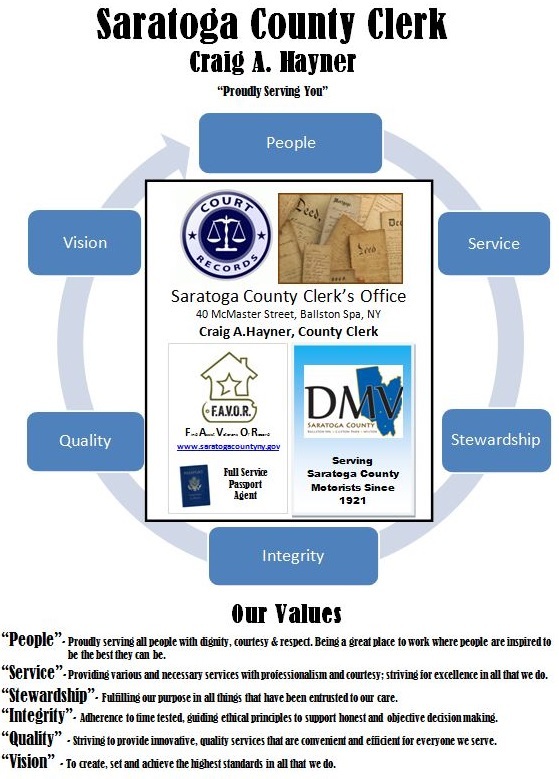 Welcome to the Office of Saratoga County Clerk. Each year, our office records and files over 85,000 documents, including mortgages, deeds, power of attorney, discharge of mortgages and judgments. We have digitized over 17 million documents, many of which are accessible online. You will also find information on forms, fees, links, and other useful tools on this website. Thank you for the opportunity to serve you and please reach out to our office if you require further assistance. *For a complete list of holidays our office will be closed, please see our 2019 Holiday Schedule.